Shortest Trip to Earth is hard. Very, very hard. As in, it took me a dozen tries to leave the starting sector, and when I did I died immediately. Considering it comes from a developer whose previous game contained the words 'Die More Edition', I suppose I can't complain I wasn't warned. It was the rats, you see. They were a thorn in my side all throughout the sector, demanding 'taxes' with threats of violence every time I encountered them. The smaller ships I could handle (sort of) but at the warp gate out of the system was an enormous battlecruiser that easily defeated me every time. It took me those dozen tries to realise I was doing it all wrong. I shouldn't be fighting the rat guard at all, I should be scouring the sector for the resources to bribe my way past them. Unfortunately, I can't speak to whether every sector works this way, because getting past the rat sentry left my ship a battered wreck that expired immediately. Now to spend hours figuring out sector two. Let's get the obvious out of the way: yes, this is an FTL-like, or whatever we eventually decide to name that genre (procedural spaceship management simulator?). 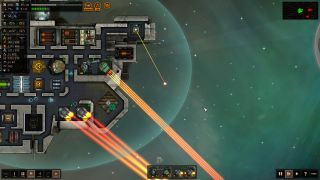 The developers say they were working on the game before FTL was even released, but it's hard not to see the influence. Difficulty and density make this take on the formula unique. The first thing you'll notice is the sense of scale is much larger. Whereas FTL kept things small, usually four or five crew members looking after the ship's systems, in Shortest Trip it's possible to start a game with ten people running around, only to acquire more as game goes on. Such a crew is difficult to truly micromanage, but thankfully most of the time they stick to their stations, or are put in auto repair mode (I lost three ships before I discovered the latter). The main times you'll want to pause and individually order your crew around is when you get boarded. Boarders are utterly devastating if you let them roam free even for a little while, as they gang up on crew members one by one. Auto-security does exist, but in my experience the security AI tends to get confused by corners. That scale and depth is also apparent in the ships themselves, which are incredibly customisable, down to the specific kind of cargo container used to carry the game's many, many resources. Those resources are a big deal, here. Much as FTL was a game of constantly chasing fuel or scrap, here you're constantly chasing half a dozen little things: organics for your crew, synthetics for repairs, excotics for bribes. I lost one combat encounter simply because I didn't have the synthetics to repair my broken guns and warp drive, and was forced to sit there waiting while the ship I was fighting very slowly killed me. These resources are acquired either through combat or from exploring planets. The latter is where the game surprised me—little text adventure vignettes pop up describing each planet you encounter, and some of the strange tales are fascinating. I've met philosophy cults and giant sentient robots and once, disastrously, herds of psychic fungi. You're constantly asked to consider your ecological impact on the environment compared to your need for resources, which is an interesting twist, and taking the more restrained option typically rewards you with fate points, a currency used to purchase better starting gear for your next ship. This environmentalist theme is unexpected, but welcome. When Sam first saw Shortest Trip in August, he was concerned about feature creep, and I'd say those concerns are well founded. There's just so much to Shortest Trip. Every system feels like a rabbit hole to dive down. You can even micromanage your food supply by putting your crew in cyrosleep between battles. I feel like I've barely begun to understand it. Rarely have I so deeply wished a game was out already so I could start reading guides and wikis. I worry that this depth is in conflict with the incredible lethality of the game. Dying quickly is fine—dying quickly after spending several minutes organising my ship and crew is less fine. Shortest Trip seems to demand I play it as slowly and carefully as possible, and yet still kills me off in a couple of enemy encounters. That said, you can start at sector two once you've reached sector three and so on. Unlike FTL, you aren't expected to do one long run, but push forward inch-by-inch, death-by-death. It's the kind of thing you'd hope a stay in Early Access will balance out, but then Teleglitch fans are hardly likely to request being able to die less. The Early Access nature shows in other places too. Twice I had to abandon a game not because of ship loss, but because I had opened a dialogue window that wouldn't close again, meaning I could no longer access the map or my ship. Honestly, for the first hour I despaired at Shortest Trip to Earth. Yet as I slowly came to understand important systems I grew more and more attached to it. I began to realise that commanding a large crew wasn't as impossible as I realised, and I could see myself grinding out each sector, one life at a time, enjoying the gentle drip feed of new ships and maps, and maybe one day finding my way home. Shortest Trip to Earth launches in Early Access on October 9th.